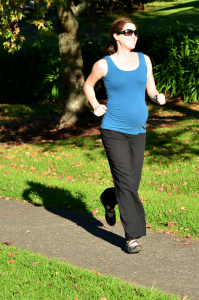 Exercise during pregnancy has a positive effect on your health and the developing baby. Women who exercise during pregnancy experience less back and pelvic pain, lower risk of developing gestational diabetes, better diabetic control if they already have diabetes, and a lower risk of complications during labour. The babies of women who exercise during pregnancy appear to tolerate the stress of labour better and are more alert and less irritable in the days immediately after birth. What are the signs that I am exercising too much? However, before undertaking any exercise during pregnancy we recommend that you discuss with your plans with your midwife or obstetric consultant. The Family Nutrition Coach can provide individualised exercise programs to meet your needs before, during and after pregnancy.